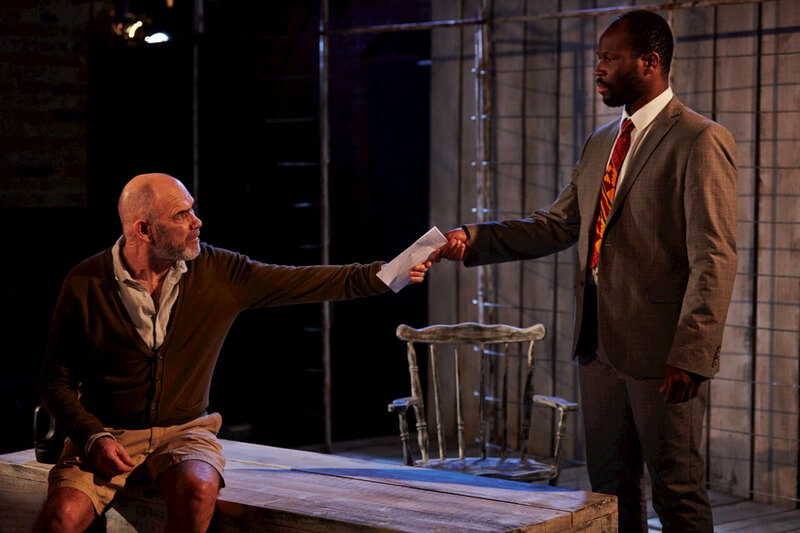 After Independence at the Arcola Theatre. “The personal life is dead, history has killed it” says Pasha to Yuri in Pasternak’s Dr Zhivago. Playwright May Sumbwanyambe does not believe this but some of the characters in his play might: white farmer Guy struggles to keep his farm during Mugabe’s efforts to redress colonial inbalance with the redistribution of property to landless blacks in Zimbabwe. The characters are fragile as a wave of tension sweeps across the country. Peter Guinness’ Guy is weathered and determined to defend his land from Charles, the black civil servant who has come to persuade him to sell to the government. Kathleen, Guy’s wife, has the clarity that comes with being soaked in gin and accepts her fate grimly, to the disgust of daughter Chipo, who, imbued with the same fighting spirit as Charles, swaps passionate invectives with him. The family’s farm feels like a prison. The family have created it themselves to keep out a changing world, but it also represents one for the future too. Designer Max Dorey’s string-like iron mesh and tall rods and harsh, wooden floors, gives us a sense of what is to come: a Zimbabwe that will suffer food shortages as non-farmers farm without any former experience. It’s a revolution without the green shoots of growth. It’s also a prison for Guy and Charles as they fight a game of words. Guy will only sign if Charles can get him to concede on a moral point. Charles can’t win the battle, and will have to employ other means to ensure history acts upon the lives of this family. Oppression lies at the heart of the play. It is the cause of its other thematic concerns, including betrayal, justice and revenge. Zimbabwe is facing the end of an era, but it is a revolution that will bring about catastrophe. But it’s the same for Kathleen and Chipo. As Sandra Duncan’s Kathleen makes devastating revelations about her life, we realise her quest for freedom is not secondary to the collapse or growth of a corrupt regime, but integral to it. For Chipo, the breakdown of the old order, is tragedy. Alone out on the farm with only her two parents as role models, Chipo can only assert herself through absorbed male ideologies, illustrated by actress Beatriz Romilly’s aggressive body language. In a world dominated by men, where the only other alternative is a drunk mother, she may not have much choice. Sumbwanyambe links white oppression with patriarchal structures that suppress and distort women too. Writing about post-colonialism is always problematic but the play is saved from lapsing into merely political writing with Charles’ ambiguous, ambivalent character. His energy lights up every corner of the family’s farm as much as their spirits depress it. But behind his smiling face lurks the cruel eyes of experience. He is different from the others because though he has their degree of self absorption, he is elevated by a modicum of conscionable awareness that can only be derived from being beaten down by a brutal, oppressive regime. If we wish that he and Chipo could make friends, it is this that prevents it. For it makes Charles believe his people’s pain and his own, is not the same as Chipo’s. It is this differentiation that drives them apart. All through the play, like a Fury, a voodoo doll hides in the branches of a tree. Later, it swings on a rope and we have the sense that this what the country could do, never mind the family. Towards the play’s uncertain end, Chipo uses the symbol of the tree as a symbol for all of humanity. But the tree that director George Turvey has hanging in the studio seems more ready to catch fire. In spite of himself, Stefan Adegbola’s layered performance as Charles wills history to strike the family with a clenched fist, even when Chipo says “This is my nation too.” This assertion leaves no room for the binary opposites Charles insists upon, and it’s the umbrella of hope we could come away with at the play’s end. After Independence is on until 28th May 2016. Click here for more details.